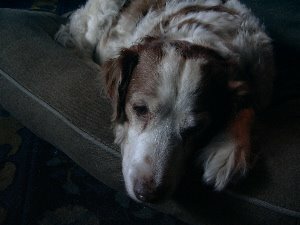 Goodbye Jordan, you sweet dog. I know Robert and everyone will miss him. Sending best thoughts to all. It’s sad to say good bye to all these little friends at once: Jordan, Toto and Tucker, too (my older brother Steve’s dog). Bye bye, little buddy. I bet that somewhere you’re still chasing squirrels, kitty-rats, Baby Dingo, and Dr. Zaius.